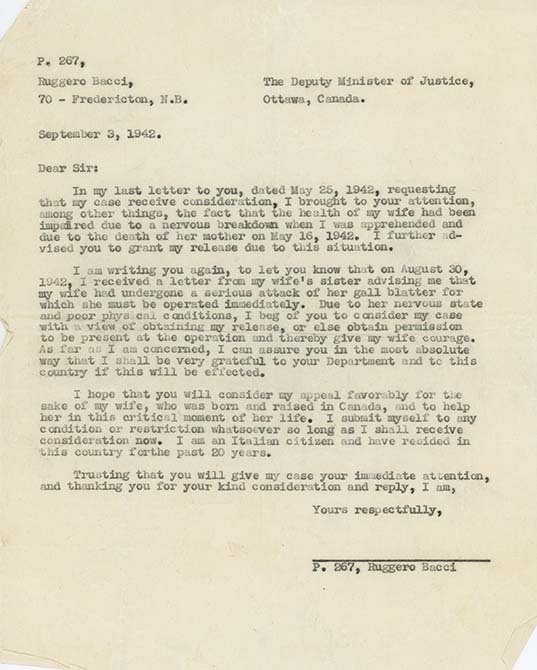 Letter from Ruggero Bacci (unsigned), to the Deputy Minister of Justice, September 3, 1942. In this letter, Bacci asks for a reconsideration of his case. He notes his wife's illness -- she requires surgery for her gallbladder. It's unclear if this letter was ever sent. The majority of internees were men with families, and often the sole breadwinners. In many cases, the families struggled. While the women did their best to make ends meet, in a few cases, their health suffered. In my last letter to you, dated May 25, 1942, requesting / that my case receive consideration, I brought to your attention, / among other things, the fact that the health of my wife has been / impaired due to a nervous breakdown when I was apprehended and / due to the death of her mother on May 16, 1942. I further advised you to grant my release due to this situation. I am writing you again, to let you know that on August 30, / 1942, I received a letter from my wife's sister advising me that / my wife had undergone a serious attack of her gall blatter for / which she must be operated immediately. Due to her nervous state / and poor physical conditions, I beg of you to consider my case / with a view of obtaining my release, or else obtain permission / to be present at the operation and thereby give my wife courage. / As far as I am concerned, I can assure you in the most absolute / way that I shall be very grateful to your department and to this / country if this will be effected. I hope that you will consider my appeal favorably for the / sake of my wife, who was born and raised in Canada, and to help / her in this critical moment of her life. I submit myself to any / condition or restriction whatsoever so long as I shall receive / consideration now. I am an Italian citizen and have resided in / this country forthe past 20 years.